1 each Return hose 6' 3/8"ID with SAE 5/8" IR coupling. 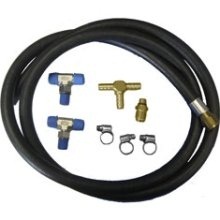 1 each Tee-fitting with 3/8" barba for return hose connections. 1 each SAE 5/8"-18-7*16"-20 UNF Flare for pump return. 3 each Non-corrosive hose clamps 5/16 - 9/16". Still requires a pair of hoses with 4-ORFS female fittings.